MapQuest, still the mapping leader with 48 million monthly uniques, has been coasting for some time. But that changed a couple of weeks ago when it redesigned and launched a new-look beta product. At the time I spoke at some length with product VP Mark Law who said that the new beta was “just the beginning” of an ambitious product roadmap that would see many changes and announcements in the coming months. MapQuest Local is built on an open platform that enables the integration of third-party feeds from local businesses, news providers, event guides, social networking sites, and other content providers. Content providers interested in providing locally relevant content to MapQuest’s monthly audience of more than 47 million consumers, can go to http://developer.mapquest.com/localquest for more information on submitting a feed. One could logically imagine this simple menu quickly being replaced by a gallery of branded publisher widgets, like the iPhone Apps store or Yahoo! Search Monkey gallery. This third party content makes the site and options much richer and better for users. MapQuest Local could also easily include coupons, classifieds, travel, product search/local shopping and so on. Right now there’s no search on the site but that will be added — and you’ll be able to search only your content widgets and related feeds. I’ve been struggling for some time to think of and define what the “next-generation” local product looks like. This, in most respects, is a next-generation local product — not the only way to go but very compelling. 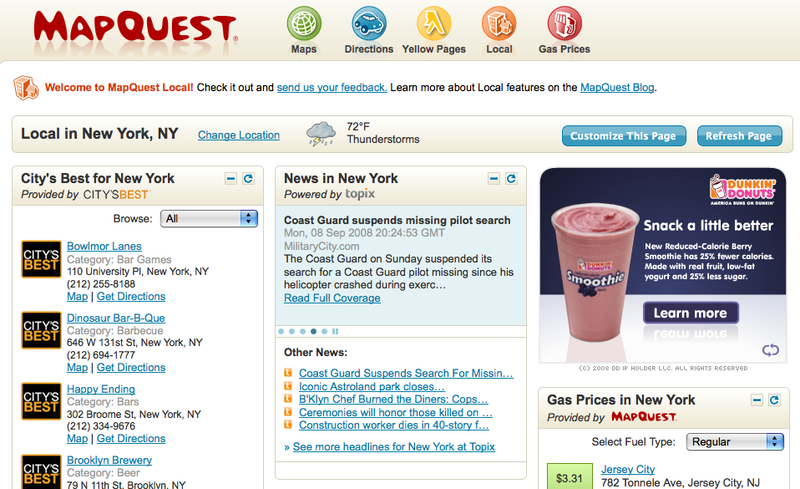 And for AOL MapQuest Local becomes the front door to all its local content. There are some very interesting ad opportunities here too: MapQuest knows location with greater precision than most publisher sites. And the concept of location here is more sophisticated in several respects. MapQuest knows where you are and where you’re going. There are ad implications for both. MapQuest can show me travel related ads (e.g., Hotels, rental cars) for I’m going and different ads at home (e.g., Macy’s, Target). I’ve often spoken about the local “product definition” and the challenge of what to include and what to exclude from a local site (should there be news, events, product search and YP listings?). This solves the problem by inviting all comers to introduce their content feeds. End users define the product. It remains to be seen exactly how this plays out but it’s a great step for MapQuest and a very intriguing step for local in general. Here’s more from the MapQuest blog; it includes discussion of features I didn’t get to. This entry was posted on September 9, 2008 at 8:51 am and is filed under Internet Yellow Pages, Local Search, Mapping, Verticals. You can follow any responses to this entry through the RSS 2.0 feed. Both comments and pings are currently closed. I agree it’s really interesting, as I said. And it’s almost entirely escaped notice by most folks.